Liverpool joined Manchester United in spending more than £100m, thanks in part to their £75m sale of Luis Suarez to Barcelona in the third biggest transfer ever. Their outlays totalled £117m, with almost £50m going to Southampton for Adam Lallana, Dejan Lovren and Rickie Lambert. Chelsea did their business early, paying £91.3m in total on deals including Diego Costa and Filipe Luis from Atletico Madrid and Barcelona midfielder Cesc Fabregas. Arsenal followed up last year's dramatic £42.4m signing of Mesut Ozil by spending £82m in the window, with two big-name strikers coming in - Barcelona's Alexis Sanchez for £35m and Manchester United's Danny Welbeck for £16m. Manchester City bought £50m worth of players and Southampton about £58m (although they received £92m for sales). Newcastle and Hull - also the busiest team on deadline day with four signings - spent more than £30m each. The four Premier League clubs in this season's Champions League had a combined transfer spend of £342m - over 40% of the total Premier League outlay. Add in Manchester United's 18% and that is almost 60% by a quarter of the teams in the English top flight. Six of the 20 Premier League clubs made their record signings this summer - Manchester United, Everton, Hull, Leicester, West Brom and Crystal Palace. Dan Jones, partner at Deloitte's Sport Business Group, said: "Last season the average Premier League club received around £25m more in central broadcast distributions than they did in 2012-13, which helped fuel a record transfer window last summer. "We are again seeing Premier League clubs use these resources to contribute to what is a new record this summer." £530m - where is the money going? Almost two thirds of the money spent by Premier League clubs this season has gone to foreign teams, with £305m staying in England. The figure of 63% is considerably lower than last year, however, when 78% of the total spend went abroad. Luis Suarez joined Barcelona from Liverpool for £75m, but English teams were busy buying some of the best that Spanish football has to offer. BBC World Service's Steve Crossman said: "It's the second season in a row that the single most expensive deal in the summer transfer window has seen a player leave the Premier League for La Liga. "At least it's a two-way street. The top three clubs in Spain all lost a major player to the Premier League over the summer. Angel Di Maria was the most expensive import, with Diego Costa and Alexis Sanchez also arriving. "And the emphasis on recruitment from abroad is not reserved to the Premier League and La Liga either. Many of the big signings in Italy, France and Germany have not come from their own leagues, with the likes of Ciro Immobile swapping Serie A for the Bundesliga, Alvaro Morata heading to Italy from Spain and Xabi Alonso arriving in Germany from Real Madrid." £425m - how does the Premier League compare with the rest of Europe? The top spending league in Europe outside the Premier League spent just over half the amount of the 20 English sides, with La Liga leading the way for the continent with a total outlay of £425m. Next was Italy's Serie A with £260m, followed by the German Bundesliga with £250m and France's Ligue 1 - with Paris St-Germain and Monaco cutting back with Uefa's Financial Fair Play rules in mind - spending £100m. BBC World Service's Steve Crossman said: "The Premier League swept all before it and only Spain could even come close. Both Ligue 1 and Serie A held back this year. In France, PSG and Monaco spent 75% less money than this time last year. "In La Liga the top three spenders in Spain were ahead of the Premier League's three most adventurous clubs in summer transfer window spending until Falcao's transfer to Manchester United took the Premier League elite back above them. "The likes of Mario Mandzukic, James Rodriguez and Luis Suarez have all arrived with massive price tags. "Likewise, in Germany the vast majority of it was forked out by a small number of teams. In this case, two. "Some £81m of the total bill came from the efforts of Borussia Dortmund and Bayern Munich. Add in the £20m outlay from Hamburg and you've got nearly half of the activity coming from only three of the clubs." From next season, spending could again rise. A new Champions League television deal comes in worth £897m over three years, worth more than double the current arrangement. 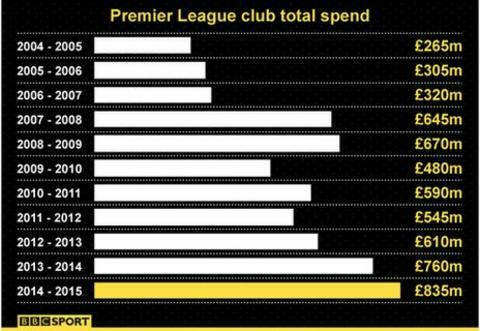 But it is not just the top teams in the Premier League who will have spending power. Stats published by Sporting Intelligence show that last season's bottom side in the Premier League, Cardiff City, earned £62m in Premier League prize and TV money - more than the previous season's champions Manchester United pocketed. The top four sides last season all earned between £90m and £100m. There are still two years left of this lucrative deal. Rob Wilson, football finance expert at Sheffield Hallam University, does not believe spending will continue to increase. He said: "Over the last three or four years there has been an acceleration in the amount of money spent in each transfer window. "There is a lot of talk about whether we'll reach £1bn worth of spending in the next one. I think that is probably bit of a stretch, the reason being Uefa's Financial Fair Play and the impact that will undoubtedly have on the top six or eight teams. "The truth is that if you removed Manchester United's spending then in this transfer window you would be looking at something we'd consider normal - well, normal in the most liberal sense of word because I don't think spending £600m can be considered normal."